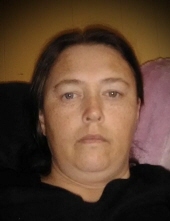 Margaret Gail Brown, age 40 of Hueysville, Kentucky, passed away on Monday, April 1, 2019 at her residence. She was born March 2, 1979 in Laurel County, Kentucky to Roger Jones of Manchester, Kentucky and the late Willa Dean Burns Jones. She was the wife of Clarence Brown. Along with her father she is survived by her Brothers: William Jones of Manchester, Kentucky, Michael Jones of London, Kentucky & James Jones of Manchester, Kentucky; Sisters: Connie Reid of London, Kentucky & Flossie Jones Miller of Manchester, Kentucky; 7 Nieces & Nephews. She will be missed by all that knew and loved her. "Email Address" would like to share the life celebration of Margaret Gail Brown. Click on the "link" to go to share a favorite memory or leave a condolence message for the family.